With every season change, we encounter issues transitioning into wearing appropriate clothing, new shoes or boots, and playing outside when the weather is colder. Earlier this year, we discovered that social stories have helped my oldest son tremendously. A quick read through and he's ready to try whatever is in the story. So now that the snow and freezing cold temperatures have arrived here, J is resistant to wear new winter boots and new winter gear. 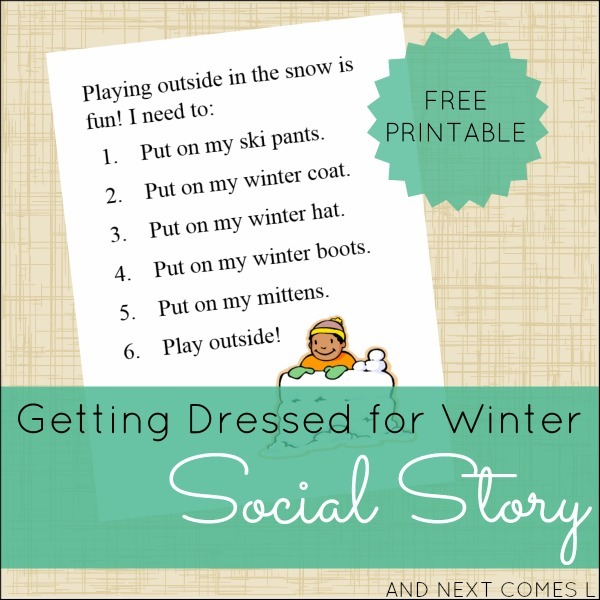 To help with the transition, I quickly whipped up this social story about getting dressed for winter. We immediately had success! No more tears or fights about putting on all the new winter gear. I like to laminate all of our social stories to make them extra durable, but it is completely optional. I also printed and laminated one to put inside his locker at school to help make him more successful at school. Day one at school was a success, so YAY! Here's what the printable looks like. It's free to download.